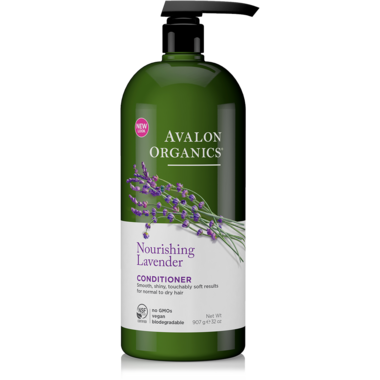 Avalon Organics Lavender Nourishing Conditioner nourishes and moisturizes as the rich, oat nutrition of Beta Glucan strengthens for healthier-looking hair. To Use: Massage into clean hair from the roots to the ends. Leave on as long as desired to absorb the enriching benefits of Beta Glucan and Babassu Oil. Rinse. Ingredients: Purified water, organic helianthus annuus (sunflower) oil, cetyl alcohol, cycloentasiloxane, dimethicone, stearic acid, stearyl alcohol, cetrimonium chloride, cetearyl alcohol, polysorbate 60, soyamidopropalkonium chloride, organic lavandula angustifolia (lavender), calendula officinalis (calendula) and chamomilla recutita (chamomile) extracts, beta-glucan (oat), babassuamidopropalkonium chloride, bisabolol (chamomile), sodium chloride, arginine (amino acid), organic orbignya oleifera (babassu) seed oil, ethylhexylglycerin, tocopherol (vitamin E), panthenol (pro-vitamin B5), organic lavandula angustifolia (lavender) oil and other essential oils.